2. In a mixture, beat butter and sugar till white and fluffy. 4. Finally add the sifted flour to the cream mixture alternately with milk. Stir until just blend to ensure a smooth light batter. 5. Pour into baking tin and bake at 350degress F(175 degrees C) for 55 mins or until cake springs back when lightly touched. Remove from pan and allow to cool. 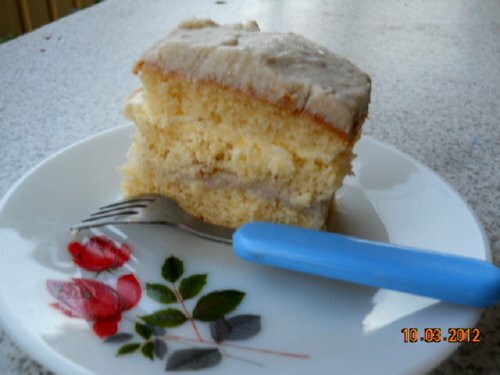 6.Slice cake into 3 layers. 1. Melt butter and sugar over medium heat till sugar is dissolved. Add in yam puree, coconut powder and milk. Stir till almost dry. Leave to cool. 2. Place 1 layer of sponge cake onto a cake board. 3. Spread 300 gm. yam mixture on top and spread till evenly distributed. 4. Cover the yam mixture with a layer of sponge cake. 5. Spread cake with 100 gm. of whipped cream. 6. Cover with the 3rd layer of sponge cake. Spread some whipped cream on top. 7. Stir the balance 100 gm of whipped cream with the balance yam mixture. Spoon into piping bag fitted with a plain nozzle and pipe on top of cake. 8. Chill in fridge. You can decorate the cake with some sieved cocoa powder if you like.